comi, 04 Feb 2011so no more surprises from SE at MWC... I want P1 successor with Android OS.Me too :D. I am holding on to my P1i fore more than 3 years now. I wished Neo has less than 4" screen, maybe 3.5 or 3.7 so it has bigger price difference to Arc. Anonymous, 03 Feb 2011Can someone explain this to me, why do I need to get this phone if I have the xperia x10? My x... moreProbably it will have 16M colors instead of X10 Eclair's 65K colors, which is shameful for a flagship product. so no more surprises from SE at MWC... I want P1 successor with Android OS. Anonymous, 03 Feb 2011Its not uncommon for big firms to 'leak' info about new phones, so saying that security is lax... moreIt's an advertisement technique. It is not a adversting, but source to the photos. It's all about timing. If they can keep with the schedule, it's all good. If they release it after too many delays, all these will be outdated again or consumers will have gone with other alternatives. Sorry, but this won't out sell HTC's devices like the Desire HD, and even the Desire. You know why? Because HTC has already made a name for itself with the HTC Sense, and the awsome build quality of the devices. Yes, camera-wise its not as good as the SE, but who cares, HTC feels more expensive in the hands, and performs better. I do not know what is wrong with SE. I was a fan before, when they used to make the wonderful Wolkman and Cybershot phones, but after HTC emerged and took over the market with the Android platform skinned with the Sense UI, SE is way behind Apple and HTC. They can't get back the trust of the customers that they used to have when the once used to make greaat phones. I hope they will come bach with this phone and the Arc. They need better marketing names. What do they mean by Timescape/Mediascape UI? This is not a name. Creat a brand name, just one, and make it make SENSE, and market your devices more with that name. And reduce the bugs, and use Aluminum, not cheap plastic. Put some more weight to the device, so that it feels more expensive and solid. So it's pretty much an ARC with a front facing camera? That's all I can really gather from this thing. Which I kind of prefer. The Xperia ARC is a beautiful device, but I really want something I can video call with, so this thing kind of looks a little better in my book. However, having the camera in the dead center of the phone, that's just strange. I do hope a Vivaz Pro 2 comes around too.. 4-inch screen on an Android with a slide-out qwerty.. By the way, I have a vivaz pro, and I love everything about it (except the lack of SE support for Symbian)..
Techradar got the screen dimensions wrong. Its 3.7, not 4!! On source site, they say screen is 4" big. Can't be. Here it is compared to Samsung Galaxy S. It's smaller. 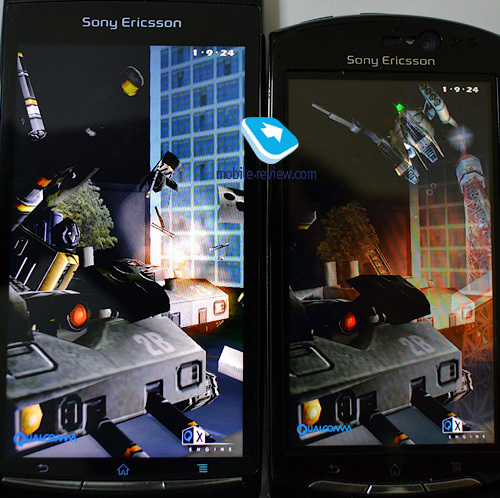 http://www.gsmarena.com/sony_ericsson_xperia_hal­on_previewed_ahead_of_launch_loved-news-2240.php­. besides why would SE release 2 handsets with same specs and screen size. This one and Arc. What the? The specs are virtually the same as the Arc.... this thing looks ugly compared to the Arc, so why would anyone buy this?